We are starting our blog posts for 2013 with one of what we plan on being a series of blogs written by guest bloggers who we think have something interesting and useful to say to our readers. 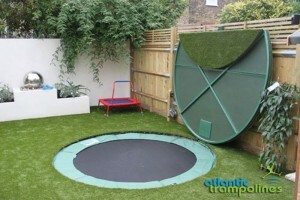 The first guest post is written by Angus MacWatt, a partner in Sunken Trampolines, who are the UK’s specialist installers of in-ground trampolines. 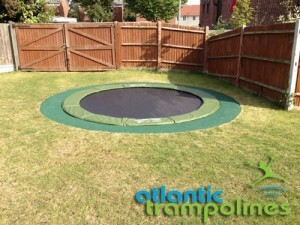 The blog includes some advice on what to consider as well as some photos of in ground trampoline installations they have completed. Sinking a trampoline into the ground so it becomes a ground level trampoline is becoming increasingly popular, however it is not without problems. Before commencing such a project you need to consider drainage, how the air movement below the trampoline will be handled and a durable structure to retain the side walls of the hole. In order to overcome this you must erect a barrier between the trampoline frame and the wall of the hole. It has been suggested that a timber frame will suffice, again while this is fine in the short term in the longer term the wood will rot and again the walls will subside. Not only that but with a timber frame you would have to screw it to the trampoline frame – something we have seen done. This immediately nullifies many of the trampoline manufacturers guarantees. We suggest that a single depth brick or block retaining wall is the best, most efficient way of providing the piece of mind that your in ground trampoline will retain its structure for years to come. Covering the bricks for safety and aesthetics is also an important thing to consider. Coverings must ideally provide a cushioning effect in case the user should find themselves jumping off the trampoline. Finishings for in ground trampolines can include rubber play mats, artificial turf or rubber tarmac as seen in many playgrounds. What is important is that it covers the bricks. “In ground trampolines” as seen supplied by some suppliers can be used. In reality it is not at all necessary as any good sturdy trampoline made of galvanised steel will suffice. The key is to ensure it will not rust. In our experience the key to a good sunken trampoline is the padding covering the springs. Because the trampoline is at ground level the padding tends to be walked on far more than when it is above ground with an enclosure. A good thick and sturdy padding therefore becomes all the more important. A cheap trampoline from your local DIY shop therefore is inadvisable! As the old adage goes buy cheap buy twice. Ensuring adequate drainage is also an extremely important factor. Soil type will dictate to a certain extent however every sunken trampoline should have a layer of drainage to cover the underlying soil. This also acts as a barrier to plants growing and you ending up with a fernery – something we have seen with improperly installed sunken trampolines. So before you embark on this project think carefully about how you are doing it. Getting it right now will alleviate problems in the future. 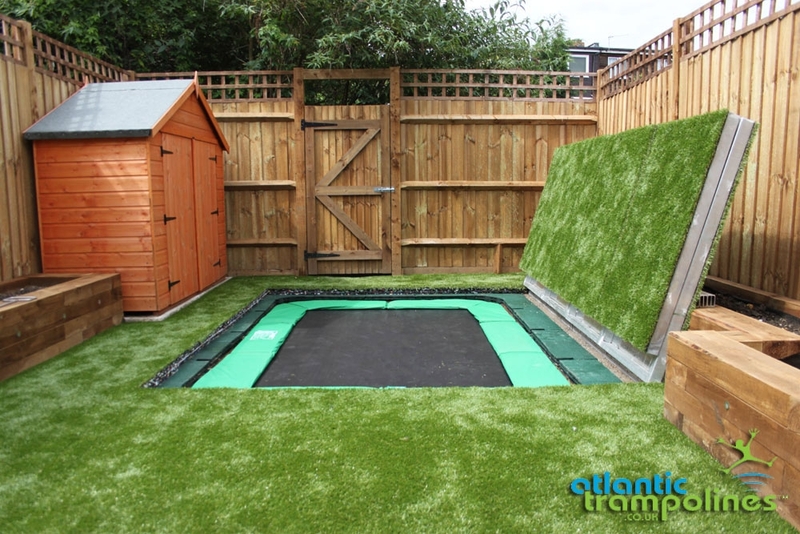 All the Atlantic Trampolines are suitable for in-ground installation. Our frames are galvanised both inside and outside the tubing providing security against rust. Our spring padding is also strong and durable being covered with a layer of tough UV stable rubberised PVC. 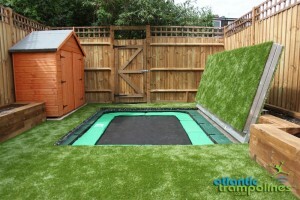 Further information can be found on Atlantic Trampoline’s related blog post “How to sink a trampoline in the ground”. This entry was posted in In Ground Trampolines. Bookmark the permalink. What’s so important about outdoor play?